I (Nina) will soon be running my first gaming session as DM. I have actually been Dm before, but only in one on one games. So this time will be my first with multiple players. My game will be part of our project where we switch DM every 2-4 sessions. Im feeling rather nervous about having to DM for several people even though I know its silly. I have been playing D&D for about 8 years now but only ever had 1 person be the DM. Until we started playing this new game a few months ago. So I dont have a whole lot of experience with different types of games since I've only ever really seen how 1 person does it. And the game I am working on is very different. It is not so much because the story is super special or anything like that, but more that my dungoen, which is a big old castle, is filled with different encounters and traps. And these encounters are just so different than what im used to seeing as a player. I think im mostly nervous because Im scared that the players wont find it fun or that it will be too easy for them. I find it super difficult to calculate how long it will take them to finish the adventure. I dont want them to be done after a few hours, but i also dont want it to drag out over more than 3 sessions. I do plan on writing more about my adventure, and maybe even publish it on http://www.dmsguild.com/ , after we are done playing it. 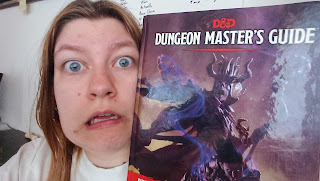 Have any of you ever had DM-anxiety before and how did you cope with it?